This plant (photographed at the ex-job) doesn't so much appeal to me or not appeal to me as it leaves me kind of scratching my head, wondering why it was necessary. There would be a certain novelty in having a Dracaena deremensis that looked like D. fragrans 'Massangeana,' except that according to the most recent taxonomic rearrangement, D. deremensis is D. fragrans, and although I like pretty much every D. deremensis variety I've ever encountered, it's hard to get terribly excited over strappy green leaves with a central yellow stripe, given that we already had one of those and it still works just fine. On closer examination, there are some subtle differences. D. fragrans 'Massangeana' usually has leaves which are longer and broader, with slightly wavy margins, so an argument could be made that 'Hawaiian Sunshine' is a little tidier-looking than 'Massangeana.' 'Hawaiian Sunshine' is also a bit glossier, and according to the on-line hype, it's also better at maintaining its variegation in low light (both of which are typical of plants called D. deremensis). I personally remain unconvinced that 'Hawaiian Sunshine' is that big of an improvement on 'Massangeana' (though I would accept free sample plants to evaluate, hint hint), but what do you think? Is the form different enough to matter? How important are glossier leaves to you? Is it a turn-off that it's patented? Do we like this? Do we care? Sometimes a variety is a tougher or more vigorous grower than what's been out there previously, and then it's a worthwhile improvement even though it doesn't look markedly different. So if a 6" pot starts out around $30, how much do they want for the Dracaena? $100? $200? Crazy! I thought getting tropical plants in the desert was tough...apparently Iowa's worse. That plant is pretty, but meh. I'm indifferent to most of the larger-leaved Dracenas. I sort of like the skinnier- and redder-leaved varieties, though. As far as the intellectual property part of the plant world, I have tried and failed to understand how an object genetically programmed to reproduce can be restrained from reproduction by putting a tag on it saying "Don't reproduce!" According to the patent, it's a sport, not a hybrid, so it's probably not much better than any of the others. There may be something wrong with you if you don't like Dracaenas, though. I didn't check the price, but it was probably between $20 and $30. 6" pots start at $20, but rare (like the Aglaonema 'Emerald Holiday') or slow-growing (like Aspidistra / Zamioculcas / Rhapis) 6" plants are $25 or $30. I can't tell from the photo whether the 'Hawaiian Sunshine' is in a 6-inch or 8-inch pot, but either way, I'd be surprised if it was more than $40. Well, they're not trying to convince the plant, and I think realistically, they don't care about convincing people that much either. It's about businesses talking to one another more than anything. Is the deremensis capable of producing thicker canes like the fragrans? That might be another difference. Patented varieties always turn me off. I feel guilty doing anything resembling propagation with them which is 75% of what I enjoy about plants. I first saw this Dracaena at a supermarket in November of 2014. It caught my eye because its leaves were so beautiful---a deep rich glossy emerald green with a chartreuse lighter green stripe down the middle of the leaf. It looked very elegant and neat-looking. 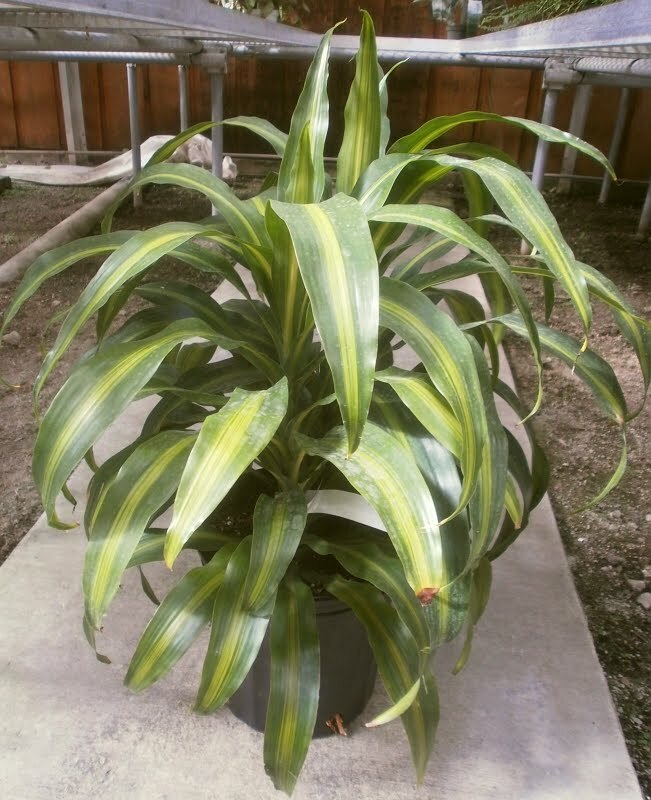 Dracaena Massangeanna 'fragrans' looks like a nice plant too, but the leaves aren't glossy like this one. I think it looks a little nicer than Massangeanna, with its glossy leaves and "elegant, tidy" appearance. The leaves aren't as "floppy" or "wayward" either, but more compact and neat. I'm glad I bought it.